BiG provides equity finance and business support expertise to established owner-managers, or potential managers, who can demonstrate growth potential, coupled with good management skills or an established track record. 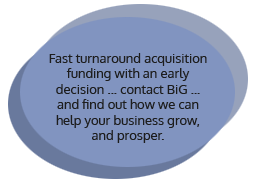 BiG is able to provide equity funding from £10,000 to £1 million and more. BiG will help businesses of any size, and it will syndicate with other financial partners to offer the best total, balanced-funding package. During the last twenty years, BiG has assisted over 70 companies (52 percent of which are still progressing) and has invested more than £24 million. It has created a vital regional funding source. It has given direction to small and medium size enterprises in the ‘North East of England’ who are looking to start-up or develop their growth. BiG members also assist in developing entry or exit strategies. Because of BiG’s expertise and high profile networking programme, its members are exceptionally well placed to understand the problems of the entrepreneur. BiG members are also able to provide a wide range of professional skills to assist companies, both pre-and post-investment. 1. Application for businesses under two years old. 2. Application for an established business over two years old.